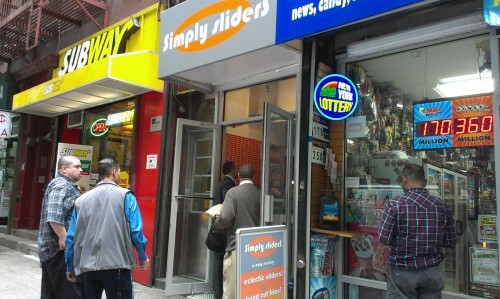 Simply Sliders, the closet-sized kitchen on 43rd St. (btw. 3rd+Lex), has expanded its menu of belly bombers, and since I was a big fan of their original offerings, I had to try them out. The results were good. Adding to its line-up of the Classic, Kefte, and Crispy Filet, Simply Sliders now has the Black & Blue, Chipotle Chicken, BBQ Chicken, and Americano. The Americano is essentially the Classic without bacon (turkey bacon to be specific, or ‘T-bacon’, as Simply Sliders calls it) and with the addition of hot sauce. The others sounded more interesting, so I skipped the Americano. Before getting to the new sliders, I should mention right off the bat that in my original review, at least one commenter took issue with the buns, complaining that they were too hard. I thought they were soft, but at my latest visit, they were not. They didn’t ruin the burgers for me or anything, but they weren’t the soft buns I remembered. 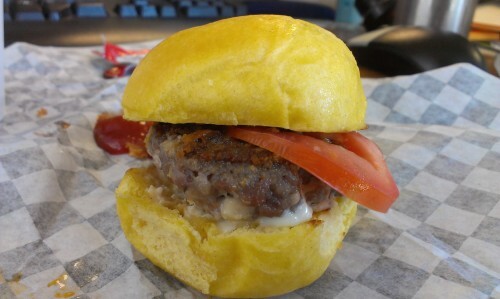 The Black & Blue is a beef burger with Gorgonzola, mayo, sauteed onions, turkey bacon, and tomato. As with the classic, it’s a juicy, well-cooked burger. The problem with mine was that it seemed to be missing a few ingredients, namely the turkey bacon. I also could see any Gorgonzola (I think it was mixed in the mayo), but I could certainly taste it – so much so that it overwhelmed everything else. If you’re a fan of bleu cheese, that might not be a bad thing, but I think the bacon could have helped balance the ingredients of this burger. It was sorely missed. Next up is the Chipotle Chicken. I was disappointed with the Crispy Filet when I first had it. It just didn’t have much flavor. 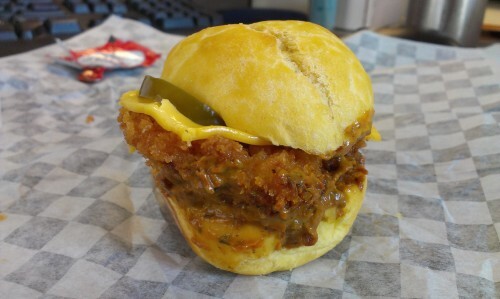 But with plenty of adobo aioli, American cheese, and a slice of pickled jalapeno, flavor wasn’t a problem this time. It was smoky and spicy, as anything with chipotle should be, and the American cheese did well to balance out the heat. Last, but certainly not least, is the BBQ Chicken. It was my favorite of the three. I was surprised to see that this slider didn’t feature fried chicken, like Simply Sliders’ other poultry offerings, but a chicken burger patty. The patty was well-seasoned, moist, and flavorful. It also had a good texture, like the chicken had been coarsely ground. It didn’t have a spongy or smooth consistency, as most chicken burgers tend to have. 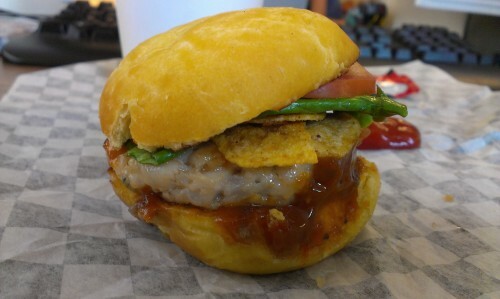 Atop the chicken patty is barbecue sauce, sauteed onions, a barbecue potato chip, lettuce, and tomato. The sauce was great and had a good, peppery kick. The potato chip added a bit of a crunch and bolstered the barbecue flavor, but a few more would have made it more satisfying. With my sliders, I decided to try the onion rings. They were pretty good, and surprisingly crunchy, but were unevenly seasoned. 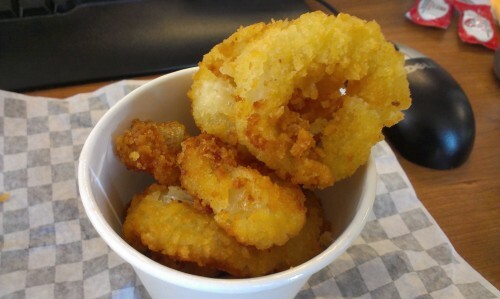 My first ring was nice and salty with the onion itself standing out, but most were sort of bland and greasy. So Simply Sliders now has a few more good options to choose from, but there’s a bit of bad news coming along for the ride. Whereas sliders used to cost $2 a piece, they now cost $2.25. You’re still not going to break the bank, but it’ll add a dollar or so to your order, depending on your appetite. Thankfully, they’ve also got a new lunch special where you get two sliders plus fries or a soda for $4.99. That’ll save you a buck, but two sliders and fries does not a lunch make. Posted by Dan at 11:30 am, July 26th, 2013 under 43rd btw. Lex+3rd, Burger, Simply Sliders.